Limited audiophile pressing, heavy 180 gram vinyl disc, single album. 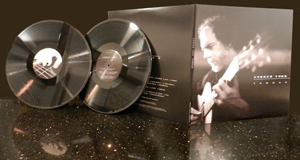 Side A - "The Equations of Beauty" Side B - "Home"
Limited audiophile pressing, heavy 180 gram vinyl discs, double album. Music Score Downloads you can print in minutes. Woven Harmony $9.99 Collectors Edition Series complete. Linus and Lucy $9.99 Collectors Edition Series complete. Seven in Essence $9.99 Collectors Edition Series complete. FLAC files for "Yamour" are available only from Majian Music. FLAC stands for Free Lossless Audio Codec. These files are encoded at 24bit 96k, the same as the original studio master, offering uparalled audiophile quality. Owning 24bit FLAC files is like owning the Master recording itself!